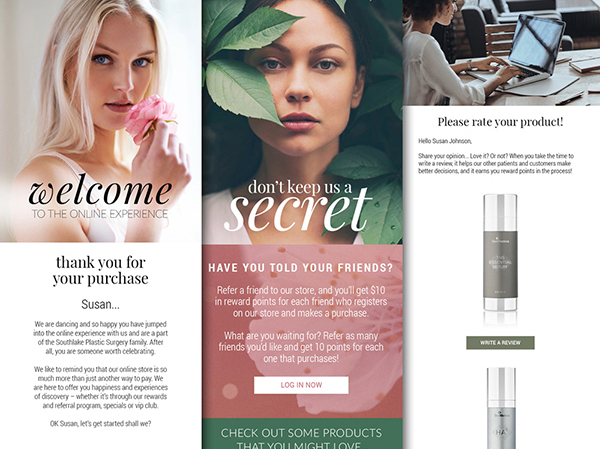 For 5 years now, DermPRO has been serving our clients with ecommerce and email marketing solutions, including our very popular monthly bulk promotional emails to help you market specials and events to your patients. We enjoy creating beautiful and professional promotions offering some of the highest open and click rates in the aesthetics industry. But did you know that our transactional (order-related) emails and targeted remarketing emails enjoy even higher open rates and results? The key is to leverage the powerful and important email channel with personalized messages that foster retention and further activity. You’ve probably heard the terms Remarketing and Retargeting, both of which aim to reach potential customers who have visited a website, and further engage with them based on their behavior on the site. While Retargeting generally uses cookie-based pay-per-click ads as a means of follow-up, Remarketing generally uses emails as a means of follow-up. Remarketing Emails have the power to turbo-boost your Customer Engagement and Retention by setting up automated email engagement based on behavior on your online store or in the office. Emails resulting from a visitor’s own activity—Transactional Emails and Remarketing Emails—carry the highest open rates, which means they are a ripe opportunity for further engagement and upselling. Like our premium transactional emails, Automated Targeted Emails—also called drip campaigns or remarketing series—will help you achieve increased conversions and result in more repeat purchases. Turn your subscribers into first-time purchasers, your first-time purchasers into repeat purchasers, and your loyal patients into big spenders and advocates with targeted emails that get relevant messages to each individual. Whether it’s transactional—order, shipping, abandoned cart, review reminder, or reward points—emails or remarketing—New Patient, First Purchase, Big Spender, or Win-Back Series—emails, you will see drastic results when you begin to communicate with your patients in these more meaningful and relevant ways. Think about how you can segment your email subscribers in order to achieve your practice’s goals. Want to convert BOTOX® Cosmetic patients into JUVÉDERM® patients? You need an automated series that speaks directly about recommended products and services, highlights your store’s rewards program as well as Brilliant Distinctions benefits and other manufacturer reward programs, and times the emails just right. Usher your patients along a path of increased engagement, whether you want to encourage product replenishment, offer complementary products and procedures, or make brand-based and regimen-based recommendations. Email Personalization is the name of the game, and your ability to segment your patients behaviorally, demographically, and transactionally will allow you to be more personalized. Contact DermPRO to find out what you can do to ensure that your promotional emails, transactional emails, and targeted messages are working together to increase conversions and patient loyalty. We are your partner in making your email messages more meaningful to your patients and valuable to your practice. Next PostNext Aesthetics Specials and Promotions Every Month: Done! Personalization is the name of the game, and your ability to segment your patients behaviorally, demographically, and transactionally will allow you to be more personalized and increase conversions and patient loyalty.